A Bellarmine Theological Forum patron alerted me to a discussion taking place on a Protestant blog regarding the topic of Justification. He said that one of the participants was Professor R. Scott Clark of Westminster Theological Seminary (WTS) in Escondido, CA. As many BTF patrons know, I graduated from Westminster Theological Seminary in Philadelphia, PA, so I am well familiar with the caliber of men that teach there and the approach they take toward theology. Among the many things I said, I emphasized that I had mentioned the case of David’s justification in Romans 4:5-8 three times during the interview as one of the most important scriptural supports for the Catholic doctrine of Justification, but I had also remarked that Dr. Horton never followed up with a discussion of David. Apparently, some Protestants of the Calvinistic persuasion were a bit bothered by Horton’s reluctance to take up the issue of David so they brought it up on the blog of Professor R. Scott Clark. The name of the blog is Heidlblog, named after the city of Heidlberg where some of the Calvinistic doctrines were forged. 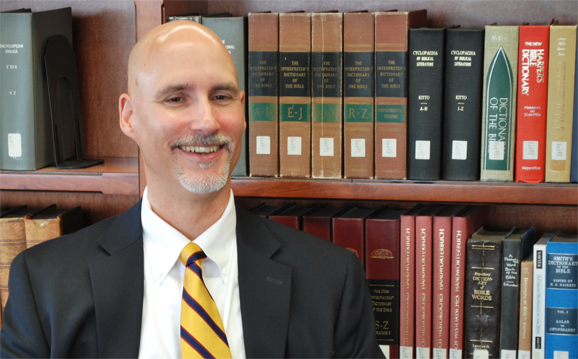 In the blog, Dr. Clark responds to some of their questions. I have copied the blog discussion and have made intermittent comments along the way. Venue: The White Horse Inn, a Protestant radio show broadcasted to over 50 stations nationwide, which includes a bi-monthly magazine titled Modern Reformation. In this interview, Dr. Horton inquiries, once again, into the Catholic understanding of Justification – how a person is justified before God from his sins so that he can go to heaven. Twelve years ago, Dr. Horton, along with his colleagues Robert Godfrey and Ken Rosenblatt, had a debate against Robert Sungenis, Patrick Madrid (now editor of Envoy magazine) and William Marshner (professor at Christendom College). Since that time, there has been no movement from either side in modifying their position on Justification. In the September/October issue of Modern Reformation, Horton devotes the whole magazine to promoting the Protestant Reformed beliefs of Justification, and does so mainly by castigating any understanding of Justification that does not adhere to the “faith alone” formula that he and his colleagues believe. His radio program, The White Horse Inn, devoted itself exclusively to the subject of Justification the whole month of September and into October. 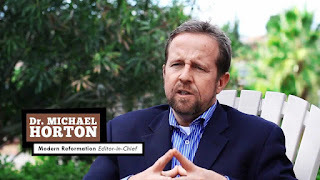 Dr. Horton presently teaches at Westminster Theological Seminary in Escondido, California. Westminster Seminary is the leading breeding ground for all things believed from the Calvinistic persuasion. It is the seminary from which I graduated in 1984 and which subsequently put me in the unique position of knowing their beliefs from the inside out. After the interview (which was conducted in the summer of 2007), I sent Dr. Horton my book Not By Faith Alone. I critique Dr. Horton and his views about a dozen times in the book (e.g., pages xli, 195, 360, 405, 439, 461, 574, 589, 593, 596, 598, 602, 628), along with all his other Calvinistic academic colleagues, such as John Murry, Richard Gaffin, R. C. Sproul, Robert Godfrey, Alister McGrath, Roger Wagner, et al. Headlines were made round the world a few months ago in the secular newspapers reporting that Pope Benedict apparently squashed a 2000-year old Catholic tradition as he rejected the belief that Jesus was born on December 25, 1 BC or 1 AD. The newspapers further remarked that the pope believes Jesus was not born in a manger and there were no animals at his birth. They had their fun with it. Now let’s get serious. In reading the reports one gets the impression that the pope wrote a lengthy treatise on Jesus’ birth date and concluded from his vast research that Catholic tradition was not to be trusted. The secular press would be quite happy with such a conclusion since it would bring yet another blow to the traditional faith and mores of the Catholic Church and add to the cultural distance the modern world wishes to have with the medieval past. Expecting the worst, I quickly ordered the book and read all of its 132 pages. 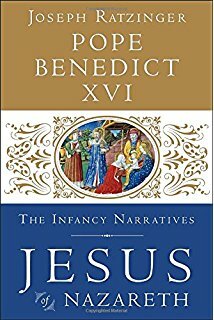 The title is: “The Infancy Narratives: Jesus of Nazareth” with the author stated as “Joseph Ratzinger, Pope Benedict XVI,” which is the same dual authorship he used for the first two volumes. We must note here that he is the first pope to engage in such a dualistic approach to the papal identity. 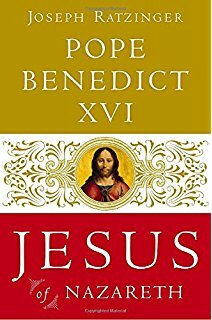 My feeling is that Joseph Ratzinger likes being a biblical scholar much more than he likes being pope, and that he accepted his selection as pope only because he knew that the crop of liberal and heterodox cardinals in line to replace John Paul II would have been an even worse nightmare for the Church. Although I was admittedly confused by the pope’s use of two names, I think at this point it may be healthier than I thought previously. It helps the Catholic populace at large to distinguish between the pope’s official teaching and the speculative thoughts to which he is entitled as a private theologian. Anyone who has been in theology and biblical interpretation long enough knows that they are, to use an expression, not exact sciences. The pope’s book helps us to distinguish the pope as a man and the pope as the vicar of Christ on earth. It also helps us to reject the virtual pope worship that many EWTN Catholics erringly cultivated during the reign of John Paul II when they refused to separate the vicar from the man. 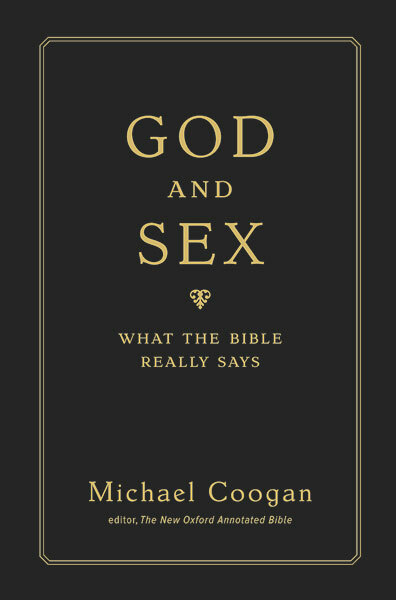 362 pages, published by Ignatius Press, San Francisco, CA, 2011, ISBN: 978-1-58617-500-9. Reviewed by Robert A. Sungenis, Ph.D. In the history of the Church it’s not often that a private book is published by a reigning pope, but Vatican II popes apparently started a trend. 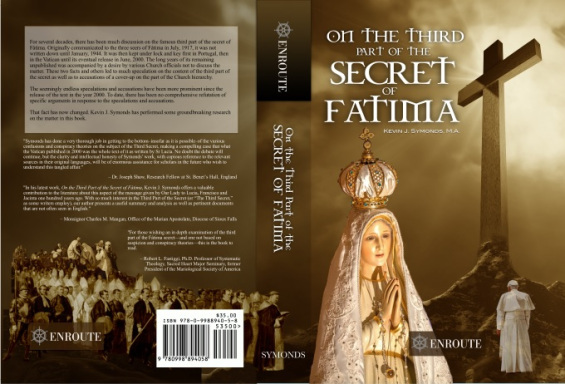 John XXIII published a couple of books; Paul VI doubled that; John Paul II doubled Paul VI, and now Benedict XVI has almost doubled John Paul II, and in half the time. Prior to Vatican II hardly any pope wrote a private book on theology. I’m not sure of the reason for this trend. 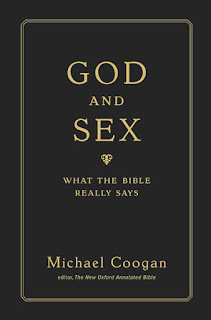 I am more concerned with the fact that it tends to foster what E. Michael Jones calls the “I/We dichotomy” which “demeans the papacy by allowing the pope to become a celebrity” for the purpose of “establishing the bounds of permissible discourse according to a political agenda…”1 In other words, what cannot be said officially because of ecclesiastical constraints is said unofficially in order to achieve a desired result. Paul VI apparently saw another side to this potential duplicity when he said: “Is it really right for someone to present himself again and again in that way and allow oneself to be regarded as a star?”2 Perhaps this same temptation also hampered our first pope. It was Pope Peter in Galatians 2:11-21 who, when he decided to engage in some private and unofficial commentary on the Gospel under the name Cephas, eventually shunned his Gentile converts and instead bent over backwards to placate the hostile and unbelieving Jews, upon which he was severely upbraided by Paul for “perverting the Gospel.” This is an ever-present danger for a pope when he is wearing the papal tiara; how much more when he dons a hat with the title “private theologian”? As we shall see, it may be no coincidence that the Jews who made the Cephas-side of Pope Peter stumble in proclaiming the Gospel are eerily similar to the Jews today who are making the Joseph Ratzinger side of Pope Benedict XVI stumble as well. It’s uncanny to see such a resemblance between the first century and the twenty-first century. In light of the dire warnings from our saints; the Fatima message; and Scriptures that speak about the rise of antichrist, who will now win this battle on earth between the popes and the Jews remains to be seen. By and large, Culture Wars is a voice crying in the wilderness in this day and age of decadence and faithlessness. Most of CW’s articles point out the deficiencies in the church and society that few others are willing to mention, much less investigate. Because CW’s message is so critical, you might wonder just what kind of impact it is having. Are people listening? Are lives changing? Is society becoming more aware of the evils surrounding it? I’m sure it is to some extent, but sometimes we receive direct evidence that our voice is being heard and things are changing. When God called Abraham out of Ur, he promised to make him a ‘great nation.’ This began the history of God’s revealing his divine plan of salvation to a chosen people with whom he made enduring covenants. Thus the covenant that God made with the Jewish people through Moses remains eternally valid for them. “The Jewish Revolutionary Spirit and Its Impact on World History” A Review By Robert A. Sungenis, Ph.D.
A Review By Robert A. Sungenis, Ph.D. 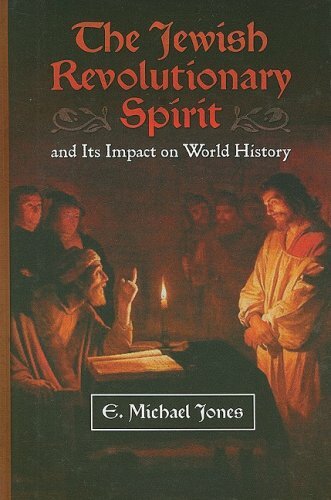 Reviewing a work as long (1000+ pages), as detailed (1000+ footnotes), and as provocative (the Jews) as E. Michael Jones’ book, The Revolutionary Jew is certainly no easy task, but it has been one of the most enriching and mind-opening endeavors I have ever undertaken. To do justice to this wonderful work would take a book in itself. I will quote from it extensively if for nothing else than to lead you to those pages and its surrounding context so that you will read them for yourself. So packed is it with mind-numbing facts and insightful commentary that one is tempted to embark on a trip to a remote place and lock oneself up in a room and absorb every word. When the excursion is over, one’s whole view of the world will be dramatically changed. You will see the inner workings of life that only a genius the likes of Dr. Jones, unclouded by the lust for power, fame or fortune, and spurred on only by his sincere and undying love for Jesus Christ and the Catholic Church, could give you. 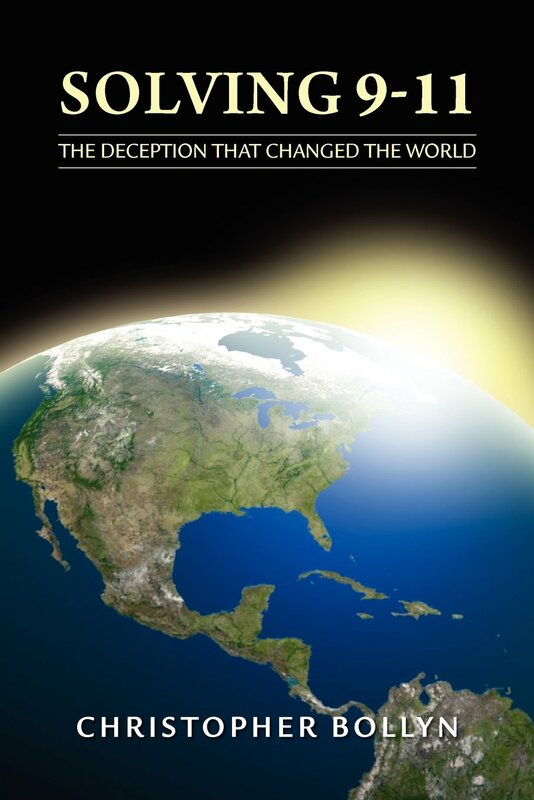 Not only will it change you, but this book has the potential of changing the world. Note well, the revelations you are about to read in Jones’ book are not things you will ever hear in a history class at Berkeley or on the website of the Anti-Defamation League. Be prepared to be shocked and awed. My recommendation is: stop what you are doing, purchase the book, and don’t come back to civilization until you’ve completed it. It is that good. But let me also warn you. Like me, after seeing the utter devastation that has been done to our society and especially its root causes, you may find yourself weeping by the time you get to the end, even as Jesus once did when he wept for Jerusalem. In his day, “Douglas Reed was on everyone’s lips; his books were being sold by the scores of thousand, and he was known with intimate familiarity throughout the English-speaking world…one of the world’s leading correspondents,” says the writer of the Preface, Ivor Benson. But by the end of the 1940s Reed had almost vanished from the scene. The likely reason for his exile was Reed’s book, Far and Wide, which took a critical look at the history of the United States. We might say the second and decisive reason was his discovery of Israel’s connection to that history. 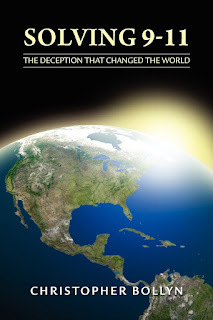 Of himself Reed says, “I am a fairly obscure person and when I went to America in 1949 was almost unknown…the publication of most of my books having been prevented by the methods above described. I found that the ADL watched me like a hawk from my arrival and from this first realized its immense spread and vigilance.” After having been invited to a dinner party by the “cousin” of a friend, Reed says, “I learned a year later that he was head of the ADL’s New York office…and thereafter the ADL knew my every movement. They knew about the book I was writing and when it was ready for publication the ‘cousin’ approached the American publisher of an earlier book of mine with a pointed request to know if he contemplated issuing this one; a man of discretion, he answered No. Three years later, in 1952…the American Legion’s magazine at Hollywood published some five hundred words from it. The ADL at once demanded a retraction from the Hollywood commander of the Legion…No inaccuracy was alleged; the deputation just called the book ‘antisemitic.’”(346) Commencing in 1951, Reed spent three years in the New York Central Library amassing this 300,000 word treatise, The Controversy of Zion, which itself became a controversy and remained in obscurity for almost 20 years before it was published. After his research, Reed concluded: “The peoples of the Western nation-states are deprived of information in the matters most vitally affecting their present and future, by a press which (they are continually told) is ‘the freest in the world.’”(346-7) I must say, by the time one gets to the end of Reed’s book, if it is all true, one cannot escape the conclusion that almost everything we see, hear and feel is an illusion created by the powers-that-be, and an overwhelming amount of those powers reside in the Zionist cartel of bankers, politicians, government officials, lobbyists, journalists, educators, scientists, professionals and Hollywood producers. The Old Covenant: Revoked or Not Revoked? 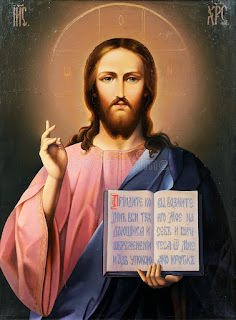 By Robert A. Sungenis, Ph.D.
More and more Catholics, Protestants and Jews are seeking to overturn 2000 years of Christian teaching concerning the Old Covenant. Although the Church has always taught that the Old Covenant is revoked, what we are now being told by theologians, clerics and lay persons in high places is that it has NOT been revoked. These critics, who refer disparagingly to the traditional doctrine by such names as “supersessionism,” “replacement theology,” “revocation theology,” etc., are all seeking for one thing – to establish the position that: (a) the Jews retain legal possession of the Old Covenant; (b) that this covenant is independent of, but runs concurrently with, the New Covenant; and (c) most hold that the Old Covenant is the means by which God provides salvation to the Jews. We are hearing this new teaching from almost every quarter of the religious world and it is one of the fastest growing problems the Church has ever confronted. At its root, it emasculates the saving Gospel of Jesus Christ, and does so for the people who need it the most – the Jews. Although I am reluctant to borrow an axiom from one of the Enlightenment’s icons, his words are quite apropos in this case. Voltaire once said: “If you wish to converse with me, first define your terms.” As is almost always the case with heterodoxy, the purveyors have a vested interest in confusing the terms, for they know that once the cloak is taken off and the illusion exposed, the game is over. 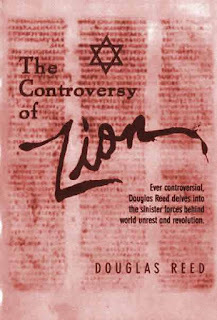 For the last several decades the term “Old Covenant” has been the victim of this shell game. Ever since the dance between the devil and Eve, the best chance heresy has of getting a foothold in a confused mind is by mixing a lot of error with a little truth. Needless to say, this is precisely what has happened in the case of the now popular belief: “The Old Covenant has not been revoked.” Unfortunately, many well-meaning but unsuspecting Catholics have been unduly influenced by its tentacles, and in this essay for Culture Wars we will do our best to untie its deadly grip. 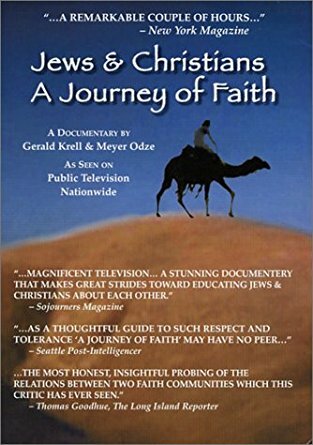 reviewed by Robert Sungenis, Ph.D.
“All critics of Jews should not be tagged as anti-Semites…that the Nazis are brutes does not make us angels....Criticism is not the same as hatred, and critics are not our enemies. The greatest friends of a people are not those who praise but those who honestly find fault. A people without criticism is either a dictatorship or a community so deeply embedded in smug self-satisfaction as to be on the road to decadence.” William Zuckerman, Jewish author. Perhaps the best place to start in reviewing The Israel Test is with the author himself. 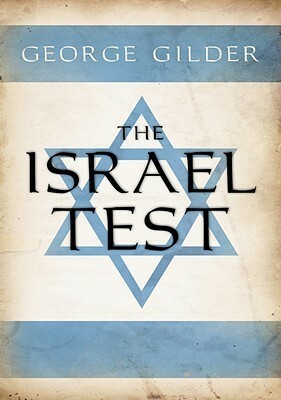 Although one might think after seeing the title, the dedication, and scanning the table of contents that Gilder is the consummate Jew, he is a purebred WASP but with a self-professed penchant for fairness, an identity that he employs quite judiciously in his book to quell any suspicion that he is biased towards Jews. He is a Harvard graduate, a Reaganite republican and die-hard supply-side capitalist, but not afraid to criticize his own party as was the case in his famous attack on Barry Goldwater’s anti-intellectualism or what he calls Reagan’s “worst, most self-indulgent and foolish moment…his speech advocating the destruction of nuclear weapons” (p. 243), for it is Gilder’s belief that “in a region full of proven enemies, an Israel without nuclear weapons would not be viable” (p. 88). 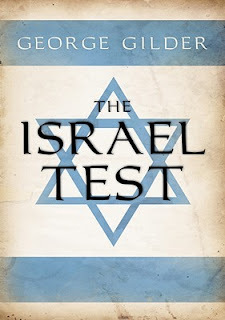 Coming from a respectable line of English authors, Gilder was a speech writer for Nelson Rockefeller and Richard Nixon and one can tell quite easily in The Israel Test that he has a flair for prose and a pungent vocabulary to get his point across. His other works, such as Sexual Suicide and Men and Marriage, made a formidable shot across the bow of feminism; while his Wealth and Poverty climbed to the New York Times bestseller list and became a pocket encyclopedia for capitalism. At one point he purchased the conservative magazine The American Spectator, which he then transformed from a political pulpit to a technology periodical, but it floundered and he was forced to sell it back to the previous owner who reversed its course. Gilder also supports Intelligent Design against the theory of evolution, which led him to found the Discovery Institute. He has many other accomplishments to his credit, including being the editor-in-chief of the Gilder Technology Report and is a much sought after speaker. In short, Gilder is an accomplished man of the world and his intelligence and his literary talents appear quite formidable. published by Doubleday, 2008, 488 pages. 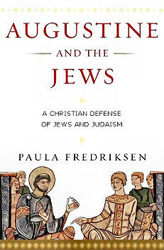 Paula Fredriksen is a Jewish professor at the Religion department of Boston University. She resides both in Boston and Jerusalem. 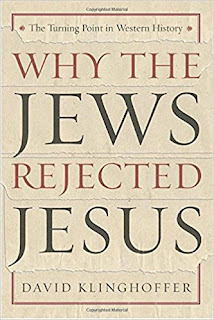 She has written a number of books about Christ and Christianity, including Jesus of Nazareth, King of the Jews: A Jewish Life and the Emergence of Christianity, which won her the 1999 National Jewish Book Award, and From Jesus to Christ: The Origins of the New Testament Images of Christ, which was used as a working document for a popular Frontline documentary. In addition to Augustine and the Jews, she has also written Augustine on Romans. In 2004, she was highly critical of Mel Gibson’s, The Passion of the Christ, claiming, inter alia, that the movie was “inaccurate” in many places. It is my understanding that Ms. Fredriksen does not claim to be a Christian; rather, she is a Jewish historian of Christianity, much like Amy Jill Levine is a Jewish professor of New Testament at Vanderbilt University but is a practicing Jew. By all counts, Ms. Fredriksen is from the liberal school of academic theology and she treats the subject of Jesus and Christianity from that perspective. This school of thought, by and large, does not believe Scripture is divinely inspired (in the traditional definition), and thus the history and even the theology is only a product of its human authors. One of Ms. Fredriksen’s more controversial claims is that the Jews had little or nothing to do with the execution of Jesus, the responsibility for that event being laid solely at the feet of the Romans. In his exegesis, he was absolutely sure that John did not mean physical water. Instead, he proposed that John’s water referred to the “word of God.” He cited Ephesians 5:26 and claimed that because Paul referred to “washing her with water by the word,” water was a symbol for Scripture. He transferred this meaning back to John 3:5 and concluded: unless one is born of the word of God (hearing and believing the Bible) and the Spirit (being “born again” by accepting Jesus in your heart) he cannot enter the kingdom of God. So, forget baptism with water as a necessity for salvation. But how can this radio Bible preacher be so sure that his exegesis and interpretation is the true one, that it should be trusted by his radio audience? What about the other interpretations given by both Protestant and Catholic scholars to this passage? The Catholic Church, along with many Protestant Churches, have taught constantly since the Early Church Fathers that the water of John 3:5 refers to water baptism, which is not a symbol but the very means to receive the grace of God to cleanse one from Original Sin.1 By what authority does one confidently determine which interpretation is true? 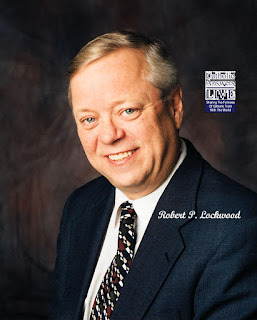 The Anti-Catholic’s Trump Card written by Robert Lockwood: Reviewed by, Robert A. Sungenis, Ph.D.
written by Robert Lockwood for This Rock magazine of Catholic Answers for the July-August 2009 issue. Reviewed by, Robert A. Sungenis, Ph.D. The attempts by Catholic apologists to produce the ultimate apology for the Catholic Church’s confrontation with Galileo never ceases. The latest attempt comes from Robert Lockwood writing in the July/August 2009 issue of This Rock published by Catholic Answers. Evidently, there is something about the Galileo affair that continues to bother good Catholics, and rightly so. A haunting question persists no matter how good the latest apology purports to be: how could the Catholic Church, who is guided by the Holy Spirit, be so blind to the scientific belief of heliocentrism in the very magisterial ranks it reveres as the harbinger of truth? A hundred and one reasons for the antinomy have been given over the course of the last 400 years – everything from “ecclesiastical bureaucracy” to “deliberate chicanery” to “religious fundamentalism” to “corporate interests’ to “unfair tactics” on the part of the Catholic magisterium, so says author Giorgio Santillana in his 1962 book The Crime of Galileo. Maurice Finocchiaro, another respected Galileo historian, admits in the opening pages of his latest work that he is driven to uncover every detail of the Galileo affair because, as he says, “a key recurring question has been whether, how, and why the condemnation was right or wrong, and that is what the title Retrying Galileo is meant to convey.”1 Finocchiaro believes the Church was sincerely wrong. Hence, his motivation for “retrying” Galileo is too find the “real” reason the Church took such a strong stance, since he can’t believe the Church could be so obtuse to science. Another apology even tried to promote the idea that Galileo wasn’t condemned for heliocentrism but for atomism, a theory that supposedly contradicted the nature of the Eucharist, so says Pietro Redondi, in his 1982 book Galileo Heretic. Cell phones, ipods, GPS, the Internet, computers, telescopes, microscopes, and even Federal Express envelopes. Our technological gadgets have certainly made life a lot easier for most of us. In the last 100 years mankind has harnessed electricity the likes of which no one before him had ever dreamed. We can do little but stand back and marvel. We marvel even more when we discover how simple the devices are. Most of these technologies are offshoots of one basic discovery – digital processing using zeroes and ones, or “on and off” switches, that operate at lightning speed. 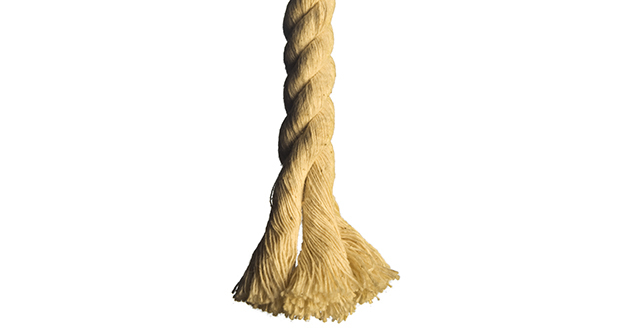 Once you discover the core principle you can modify it in multitudinous ways. It is similar to discovering a theme in music. Beethoven, after agonizing for thirty years, finally found the basic 15-note musical structure for his ninth symphony. It was then just a matter of applying and reapplying that theme in a dozen different ways to give us his beautiful melody. Applying the themes is easy; finding the themes is difficult. It is a combination of inspiration and imagination that no one can quite put his finger on as to where it originates in the human mind. 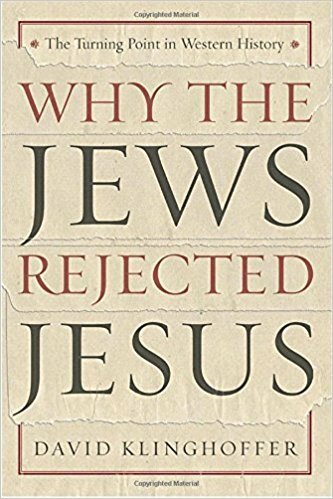 David Klinghoffer, Why the Jews Rejected Jesus, p. 215. What the “desire” means and how it is applied is, of course, a matter of debate until the Church gives a formal definition of what it intends. Although the Catechism of Trent spoke of “desire” in many places, it only spoke of the desire that must accompany the reception of the sacraments but not whether “desire” for the sacrament can suffice in some extreme instances for the actual reception of the sacrament. Having said all that, I think the burden of proof in the ongoing debate is upon those who insist that the use of “desire” was not intended to replace, in extreme instances, the actual reception of the sacrament when the actual reception is not possible. The word “desire,” as used in all ecclesiastical documents, refers to the wanting of something that someone does not yet have in reality. Hence a “desire” for the sacrament must then mean that the person desires to receive it before he receives it. This much everyone seems to agree upon. The question at issue, however, is whether the word “or” means that “either the desire of the sacrament OR the actual sacrament can suffice to receive the sacrament.” Although it is true in some contexts that “or” can mean “and,” it would be superfluous for Trent to intend “and” in the case of the sacraments since in most cases (unless the person is comatose, retarded or forced, which in those cases the Tridentine catechism says to refuse baptism unless prior desire was elicited) the desire for the sacrament is assumed to be evident or is plainly evident before actual reception of the sacrament. The fact that Trent applies “or” only to the two “salvation” sacraments, Baptism and Confession, means that “or” was used to secure salvation. As such, it gives the greatest possibility for the individual in eternal sin to rid himself of that sin so as to attain salvation, especially in dire cases in which reception of the actual sacrament is not possible. This follows the teaching of Jesus that “the Sabbath was made for man, not man for the Sabbath.” Analogously, the Sacraments were made for man’s salvation, not man for the Sacraments’ salvation. In other words, it is not the purpose of the sacrament to be as exclusive as possible, but to be as inclusive as possible. Man was not made so that he could show how rigorously the sacrament could be limited; rather, the sacrament was made to see how generously and completely it could save man. In that sense it could be said that the Sacrament was made so powerful and accommodating for man that it could transmit its powers of forgiving sin even if the vehicle for reception could only be man’s desire for the sacrament since, because dire circumstances, he could not receive the administered sacrament. 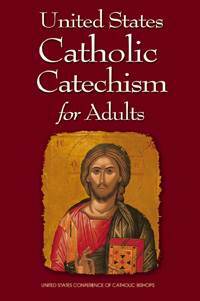 Likewise, the 1994 Catechism says in 1257: “God has bound salvation to the sacrament of Baptism, but he himself is not bound by his sacraments.” The Catechism also says in 1259: “For catechumens who die before their Baptism, their explicit desire to receive it, together with repentance for their sins, and charity, assures them the salvation that they were not able to receive through the sacrament,” showing that the Council of Trent’s “or the desire thereof” can apply in the emergency case of someone who desired baptism but could not receive the administered sacrament due to death. But by the words “it may be supposed” the Catechism admits this is an area of speculation, especially since there is no prior Church teaching on this specific issue. But since Pius IX clearly teaches in Quanto Moerore of 1863 that those who live in Invincible Ignorance can, with the right life, obtain eternal life, which thus implies that eternal life can be obtained without the actual reception of the sacrament of baptism, then it appears there is at least one case in which the 1994 Catechism’s statement “it may be supposed that such persons would have desired Baptism if they had known its necessity” could be applied. All these speculations, of course, are not ours to decide, only God’s. God, not we, have the final say on who is saved and who is not saved, and there the debate should rest. As even Pius IX said in Singulari quandem of 1854: “…it is necessary to hold for certain that they who labor in ignorance of the true religion, if this ignorance is invincible, are not stained by any guile in this matter in the eyes of God. Now, in truth, who would arrogate so much to himself as to mark the limits of such an ignorance, because of the nature and variety of peoples, regions, innate dispositions, and of so many other things?" "For, in truth, when released from these corporeal chains ‘we shall see God as he is,’ we shall understand perfectly by how close and beautiful a bond divine mercy and justice are united; but, as long as we are on earth, weighed down by this mortal mass which blunts the soul, let us hold firmly that, in accordance with Catholic teaching, there is ‘one God, one faith, one baptism’; IT IS UNLAWFUL TO PROCEED FURTHER IN INQUIRY.” (Denz 1647). “For it must be held by faith that outside the Apostolic Roman Church, no one can be saved; that this is the only ark of salvation,” thus affirming the Church’s teaching. But it is in this very context that he goes on to say that the Invincibly Ignorant can be saved, thus showing that “outside the Church there is no salvation” was not dogmatized to exclude the Invincibly Ignorant who can be saved, but to show that they are not to be considered “outside the Church” but inside the Church. 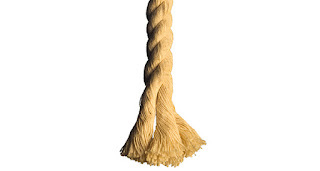 As such, the Church teaches that “extra ecclesium nulla salus” is not the black and white issue that some try to make it, but, like many things in life, it has contingencies based on the context within which it was made and is to be applied. In the case of EENS, the Church is clear there exists contingencies, and we ignore these contingencies to our own detriment, especially in cases in which our own loved ones are in Invincible Ignorance. Also, it is wrong to argue that: “Baptism is in natural water and to say otherwise is heresy,” without adding in the Council of Trent’s contingent phrase “or the desire thereof” for both Baptism and Confession. Unless the debater can make an airtight case that “or the desire thereof” cannot, under any circumstances, either suffice for the reception of the laver of Baptism or receive the laver sacramentally, and back it up from dogmatic Church teaching and Scripture, then the argument is fallacious. We must remember that in any interpretation, whether it be biblical or ecclesiastical, the context, both immediate and extended, must be included before any decision is made on the meaning and intent of a particular sentence. As such, the Council is not teaching against “or the desire thereof” in this Canon, nor could it do so, otherwise it would be contradicting itself. It is clear by the Canon’s chosen words that it is specifically teaching against those outside the Catholic Church (e.g., Calvinists) who turn John 3:5’s words, “Unless a man is born of water and the Spirit” into “some sort of metaphor,” rather than being an explicit command and dogma that water is necessary and effectual for salvation in Baptism. It was the general Protestant belief that the water of John 3:5 was merely symbolic. Some thought it was symbolic of the Bible; others of spiritual cleansing; others of the amniotic fluid. But the Catholic Church said it was the very means of grace and salvation. Further, no Catholic would ever say that “natural water is not of necessity for baptism,” since Chapter 4, Session 6 of Trent clearly says it is necessary. Rather, the Catholic, who is also bound by the words “or the desire thereof,” must reason that the “desire” for the water of baptism is permitted by the Church to suffice, in some cases, for the actual reception of the water. Once again, no one who argues that the phrase “or the desire thereof” means that “baptism is free and not necessary.” Rather, he is arguing the exact opposite. That is, to the Catholic, baptism is so necessary that the very desire for the water of baptism is required in order to be saved if a situation arises in which the laver of baptism is not possible to receive. The only ones who were saying that baptism is free and not necessary were the Protestants who believed that the water and baptism itself were “mere metaphors” for some symbolic effects. The Commission’s document is the latest post‐Vatican II attempt to forge an ecumenical and political relationship with the Jews, Judaism and Israel. The Commission states up front, however, that “the text is not a magisterial document or doctrinal teaching of the Catholic Church, but is a reflection…on current theological questions that have developed since the Second Vatican Council.” Although the Commission admits that Jesus Christ remains a divisive issue between the Jews and the Catholic Church, nevertheless it pushes forward by trying to minimize the doctrinal issues and maximize the humanitarian issues. In the process, unfortunately, the Commission sacrifices major Catholic doctrines on the altar of the Social gospel. The chief aberration in this regard is the Commission’s insistence that there remains an unrevoked and exclusive covenant between God and Israel, which becomes the foundation for the entire document. The Commission states that its official source for Catholic/Jewish relations is Vatican II’s Nostra aetate, and although admitting that a covenant between God and Israel “cannot be explicitly read into Nostra aetate,” nevertheless, the Commission argues that Nostra aetate is “located within a decidedly theological framework regarding…God’s unrevoked covenant with Israel.” The Commission then attempts to justify its position by an unconventional interpretation of various scripture passages (e.g., Romans 9:4; 11:29; Hebrews 8:1‐13; 10:9) and an uncontextualized statement in a speech by John Paul II from Mainz, Germany in 1980. 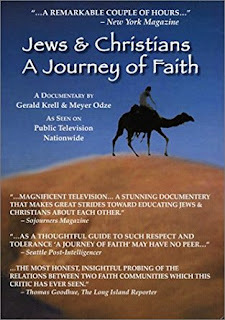 In the end, on the basis that the Jews, as a religious and ethnic body, are in an unrevoked covenant with God, the Commission then concludes: (1) the covenant puts the Jews on a higher spiritual level with God than the rest of humanity; (2) as such, the Catholic Church, as an institution, is not required to preach the Gospel of Jesus Christ to the Jews and the Jews are not required to adopt it; and (3) all this is permitted because the Commission believes that God promised to save the Jews and thus He will do so by a means and at a time of which we are not aware. The Commission also argues that this new development in doctrine is needed because preaching the Christian Gospel to the Jews often leads to anti‐semitism and catastrophic events like the holocaust. Finally, since these new developments remove the major obstacles for both sides, Catholics and Jews can then proceed in their ecumenical relations and social actions unhampered by doctrinal divides. In this paragraph‐by‐paragraph critique, we show that all this kind of thinking is indefensible.